Konstantinos (Kostas) Gerasopoulos (M.S. '08, electrical engineering; currently a Ph.D. candidate). Department of Materials Science and Engineering graduate student Konstantinos (Kostas) Gerasopoulos, advised by Professor Reza Ghodssi (Department of Electrical and Computer Engineering/Institute for Systems Research), was a featured speaker in the Micro/Nano Seminar Series, presented by the Massachusetts Institute of Technology's Department of Mechanical Engineering. Gerasopoulos' seminar, titled "Nanostructured Materials Using the Tobacco Mosaic Virus: Applications in Batch Nanomanufacturing and Electrochemical Energy Storage," provided an overview of his group's research into the development, device integration and applications of Tobacco Mosaic Virus (TMV)-templated nanomaterials, including the design of sensors and lithium ion batteries with improved electrochemical performance. TMV, one of the most studied viruses and widely used in research, is a biological, rod-shaped nanostructure that has evolved the ability to self-assemble into defined architectures. Gerasopoulos and his colleagues have been able to genetically enhance its ability to bind to metal ions and control the form into which it self-assembles. The customized TMV structure, attached to a substrate, is coated with metal ions to form nanowires that can serve as the basis of a new device, including micro-batteries. When prepared for use in batteries, the nanowires create a large surface area on which electrodes and electrolytes can interact, resulting in a higher energy storage capacity and more power than what is found in currently available products. Compared to other nanofabrication techniques, using TMV to manufacture devices is simpler, far less expensive, sustainable, and easily scaled. The products created are generally lighter and more durable than their commercial counterparts. 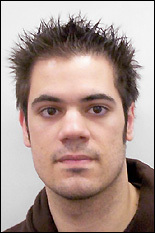 Gerasopoulos, who is currently a Ph.D. candidate, received his M.S. in electrical engineering from the Clark School in 2008. He conducts his research in Ghodssi's MEMS Sensors and Actuators Laboratory (MSAL). He is a member of the IEEE, MRS and AVS, and was recently selected to join the 2010 cohort of the Clark School's Future Faculty Program.